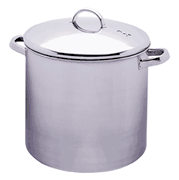 Marinara sauce, chicken stock, pasta and more can be properly prepared in this large stainless steel pot. The durability and good looks of stainless steel will be yours to enjoy for a lifetime of cooking. 12 qt.